This rubber stamp set contains 11 images including 4 stylised trees in a variety of sizes, a tree silhouette, a beautiful ornamental leaf, a set of berries, a bird on a branch, a large image of birds in a woodland glade (which requires a 6" x 6" acrylic block) and an inspirational quote. 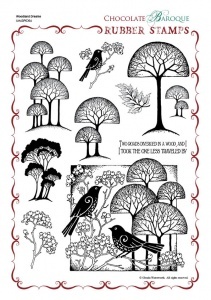 Trees are always popular images and these can be mixed and matched with other Chocolate Baroque sets including Tall Trees and Essence of Nature. Ideal for creating seasonal themes, just change the colours of the inks you use. A good standby set. Broken Biscuits are complete sets, but not all connected on a single sheet. These are not seconds, they are exactly the same quality as our full sheets, but sold at a discount as they are not quite as pretty to look at. PLEASE NOTE: Although these unmounted stamps may not all be connected they are not individual stamps and will require cutting out. Also, these sets are not available with our Cling and Cling n' Cut service.